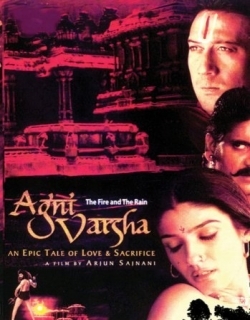 Agni Varsha is a 2002 Indian Bollywood costume drama, drama film released on 2002. The film is directed by Arjun Sajnani, produced by Arunima Roy. It is a movie based on Girish Karnad's play 'The Hue and the Rain". Yawakri goes into meditation for 10 years to please Lord Indra for rain. But when he returns, he finds that Paravasu, his cousins has gained the position of the chief priest. His father, Andhkar Baba however thinks that he is the most deserving. So to take revenge, he challenges Paravasu's father. Paravasu's father sends a demon to kill Yawakri, who for his protection had kept a pitcher of water. But Vishakha spills the water in revenge for the fact that he did not love her. The demon kills Yawaksi. Arvasu, the brother of Paravasu fails to appear before the Panchayat. The Panchayat was organised to formally announce the marriage of Arvasu with Nithilaai, a girl from a tribal clan. Nithilai's father marries his daughter to Pradesh. Paravasu comes home to meet his wife Vishakha and kills his own father and asks Arvasu to take on the responsibility of the murder. He goes back to the fort for Yasha. Arvasu faces many problems - he is called a demon and tortured by the courtiers. Nithilai tries to help him out. They secretly live with a theatre group with whom the climax of the story was planned. At the end Paravasu throws himself into the fire and burns to ashes Nithlaai's husband and kills her. The village is blessed with rain. In a kingdom stricken with drought for the past 10 years, Arvasu (Milind Soman), a brahman by caste, who has become a performing actor, much to the despise of his father. He loves Nittilai (Sonali Kulkarni) a tribal girl, who reciprocates his love, but seeks approval of her father and her village's elders before marrying him. 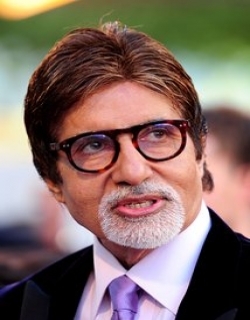 Arvasu's brother is Parvasu (Jackie Shroff) who has been conducting a major prayer ceremony to appease Devraj Indra (Amitabh Bachchan), for the past 6 years for rain. Arvasu's father is Raibhya (Mohan Agashe), who dislikes both his sons, and wishes that he cremate them before his death. Raibhyu, suspects Vishaka (Raveena Tandon) Parvasu's wife, of having an illicit affair with Yarvaki (Nagarjuna), Son of the brother of Raibhya, and detests her.Parvasu married Vishaka, lived with her happily for 3 years, before leaving her to conduct the yajna for Devraj Indra. Yavarki and Vishaka loved each other, but he left her to worship and pray to Devraj Indra for 10 years, and on his return found her married to Parvasu. Yavakree was being hailed in the entire kingdom as a saint. Nittilai used to mock Yavakri saying if he is so wise, can he predict his own death. Nittilai and Arvasu spend their day playing and dancing in their Uncle(yavakri's father) ashram. The same day, Vishakha is returning with water from well, she is confronted by yavakree, who advances towards her. She at first refuses him but ultimatley gives up and they start making out in the woods. Nittilai and Aravasu see them. Aravasu tells Vishakha to go home, while he carries her pale of water. Upon reaching home Raibhya sees Aravasu with a pale of water and Vishakha with her clothes spoiled in dirt. He curses her again and accuses her and Aravasu of adultery. He proceeds to slap Aravasu who starts crying. Vishakha intervenes and Raibhya pushes her to the ground and kicks her. Vishakha enraged tells Raibhya that she was instead with Yawakree. On finding that Vishaka has met with Yavarki, an engraged Raibhya summons a Brahm Rakshas, a demon (Prabhu Deva) to kill Yavarki. But Raibhya also declares that Yavakree can save himself if he enters the ashram of his father, this shall declare him as a coward. But this shall also mean that in return, if the demon cannot slay Yavakree, Raibhya must immolate himself. Yavakri, wanting to prove his strength enchants a pale of water and waits for the demon to arrive. Vishakha warns him and tells him to flee to his father's ashram, which shall force Raibhya to immolate himself. Yavakree refuses and begins to meditate. Vishakha suddenly throws the enchanted water on the ground and viciously tells Yavakree that he can now save himself only by running to his father's ashram. Seeing the demon approaching, Yavakree runs to his father's ashram. His father who is blind, is unable to recognize his panicked son and pushes him away from the premises. The demon slays Yavakree in one shot and then goes around dancing with his severed head. Vishakha pleads Arvasu to cremate him; this delays his appointment with Nittilai's father and her village elders, and as a result she is forced to marry a fellow tribesman. Parvasu hears of the death of Yavarki, he sneaks in the night to meet Vishakha. On his way he is met by the demon, who calls him brother and then later tells him how he is a cursed soul seeking salvation, Paravasu rudely ignores him. Vishakha confesses everything while Paravasu blames himself for his abandoning his wife. In the midst of his emotional turmoil Vishakha begs him to kill her, but he raises the arrow and shoots at his father. The next day when Aravasu comes to the city after cremating his father Paravasu subsequently blames Arvasu for this and has him badly beaten up and left for dead outside the city premises. When Nittilai hears of this, she comes to the rescue of Arvasu, and finds that she is being hunted by her husband and her brother, who will kill her on sight for dishonoring the tribes customs. Sutradhar (Raghuvir Yadav) arranges an act to entertain the Devas, but during the act, under the influence of bhang(as a prank by the girls of the dance troupe) Arvasu goes berserk, destroying the havan and throwing the offerings of fruit, ghee and milk to the starved locals. Nittilai, in an attempt to stop Arvasu exposes herself and is killed by her husband; Parvasu admits failure, confessing his murder of his father and the exile of his brother cremates himself in the yajna's pyre. Thus one by one, whoever, was close to Arvasu is dead. Finally appeased, Devraj Indra appears, and Arvasu is allowed a wish of his choice. The demon comes and begs him to set his soul free while Aravasu himself wants Nittilai back to life. Indra tells him that to bring back Nittilai he will have to turn the time back and to set the demon's soul free he will have to turn the time wheel forward. Aravasu, with teary eyes asks Indra to set the Demon's soul free, which is followed by rain. Check out this page for more updates on Agni Varsha. This page provides latest and updated information about Agni Varsha (2002) movie which released on 2002. Agni Varsha (2002) is directed by , produced by , starring .We have also provided 0 trailers and videos, 5 photos, 30 user reviews, and 0 critic reviews.Agni Varsha (2002) has received 2 rating from user reviews.The overall rating of Agni Varsha (2002) is 40 and movie is 2.Agni Varsha (2002) has won 0.001 crore awards.You can review, like, dislike this movie and also can add to favorites. You can also find information on showtimes, CDs, DVDs, online rental, online free watching.